Flynn Nagel celebrates a touchdown. The senior was one of two NU players who earned Big Ten recognition after Saturday’s win over Nebraska. Senior receiver Flynn Nagel and sophomore kicker Drew Luckenbaugh both earned Big Ten weekly awards for their performances in Saturday’s win over Nebraska, the conference announced Monday. Nagel shared the Offensive Player of the Week with Iowa quarterback Nate Stanley, while Luckenbaugh took home the Special Teams Player of the Week award. Nagel had a career day across the board, with 12 catches for 220 yards — the most by a Big Ten wideout since 2013 — including multiple conversions on third down. 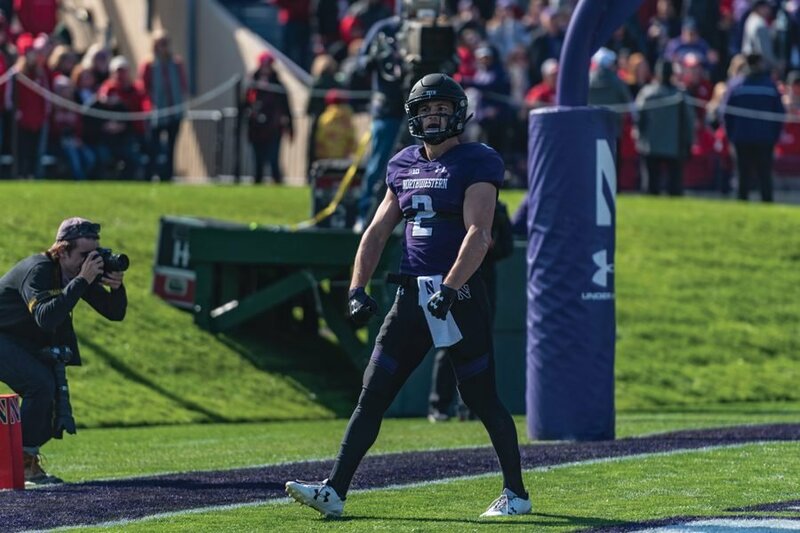 It’s been an impressive season for Nagel, who now has 622 yards on the season, more than former NU receiver Austin Carr had at this point in his breakout 2016 season. On Monday, coach Pat Fitzgerald praised Nagel’s performance against the Cornhuskers and throughout his career in Evanston. Luckenbaugh made his first career start — replacing the injured Charlie Kuhbander — on Saturday. After missing his first field goal attempt, he bounced back in a major way, converting a 31-yarder to bring the Cats within one score with 2:27 to go and then nailing a game-winning 37-yarder in overtime to give NU a wild win. NU (3-3, 3-1 Big Ten) will head east to face lowly Rutgers (1-6, 0-4) on Saturday.